External cameras on the International Space Station captured views during its overhead passes of Hurricane Irma. Most intense Atlantic hurricane observed in over a decade, Hurricane Irma was an extremely powerful tropical cyclone, which became a Category 5 hurricane on September 5. It reached peak intensity with 185 mph (295 km/h) winds on September 6. Its category dropped to 3 as it passed along Cuba, but, while crossing over warm waters between Cuba and the Florida Keys, it became stronger again and rose to Category 4 on September 10. Then dropped back to Category 3 by the time it made a second Florida landfall on Marco Island. Hurricane Irma weakened to a Category 2 hurricane later that day. As of September 12, it is not a hurricane anymore, weakened to a tropical storm, and then a tropical depression six days after its peak intensityNotes 1. The International Space Station’s external cameras captured a dramatic view of Hurricane Irma as it moved across the Atlantic Ocean Sept. 5. The National Hurricane Center had recently upgraded Irma to a Category 5 storm with hurricane warnings issued across the Caribbean. 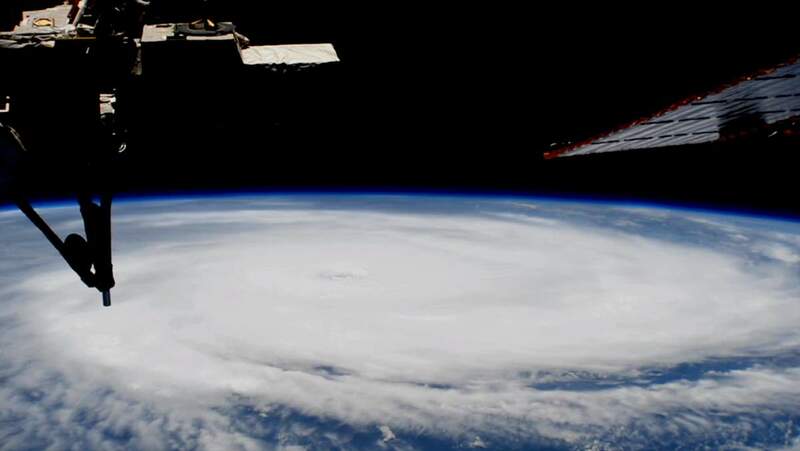 The International Space Station’s external cameras captured another dramatic view of Hurricane Irma as it made landfall in the Caribbean Sept. 6. The powerful Category 5 storm with sustained winds of 185 mph made landfall on several islands while continuing on a westward track. In the third video, the second view appears in black and white due to an issue with the sensor on the external camera. While its peak as a Category 5 hurricane, Hurricane Irma caused catastrophic damage in Caribbean countries including Barbuda, Saint Barthélemy, Saint Martin, Anguilla and the Virgin Islands. As of September 12, it has caused at least 49 deaths – one in Anguilla, one in Barbados, three in Barbuda, 10 in Cuba, 11 in the French West Indies, one in Haiti, three in Puerto Rico, four on the Dutch side of Sint Maarten, 11 in the contiguous United States, and four in the United States Virgin Islands. The cost of the damage is estimated as high as $30 billion – which makes Hurricane Irma fourth or fifth-costliest hurricane on record. In 2005, Katrina (Category 5) caused $108.0 billion damage. Other costliest hurricanes were Sandy (2012, Category 3): $75 billion, Ike (2008, Category 4): $37.5 billion, Wilma (2005, Category 5) $29.4 billion. Hurricane Irma from the International Space Station. This is a vertically flipped image. A tropical depression forms when a low-pressure area is accompanied by thunderstorms that produce a circular wind flow with maximum sustained winds below 39 mph. An upgrade to a tropical storm occurs when cyclonic circulation becomes more organized and maximum sustained winds gust between 39 mph and 73 mph.